Welcome to the most innovative and independent management, recording and production company to hit the market in a very long time! Celtic Heritage, LLC is honored to produce/manage/promote: artist Marcille Wallis/Marcille Wallis & Friends, The Caloosahatchee Celtic Festival, Celtic Family Jamboree, Christmas With The Celts, St. Patrick's Shows, Tartan Day Celebrations, and the Florida Keys Celtic Festival. Originally founded in 2000 as Celtic Heritage Productions, Inc., the company has produced ten CDs and continues to deliver quality shows that can be tailored to almost any budget. As a people-friendly enterprise we strive to fulfill all our clients' needs by listening to their desires and designing realistic, entertaining productions that keep the crowds coming back year after year. All of our clients marvel at our accessibility and the ability to communicate directly with us no matter where in our travels we happen to be. Everyone gets our direct cell phone number that is personally monitored and answered by Marcille 24-7-365!! 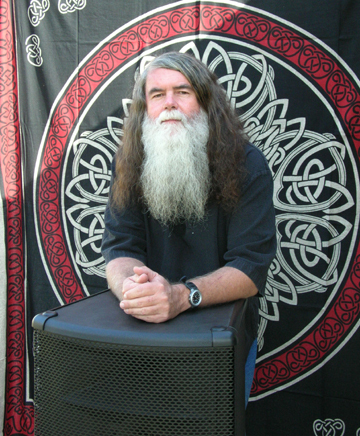 Celtic Heritage, LLC draws on a large pool of Celtic talent to provide diversity while maintaining quality in every performance. Likewise, we work with top-notch professionals to produce our festival sound, and we rely on our own high-quality QSC speaker system for concerts. We have the proper personnel and equipment to cover almost any gig! Live Concerts, Pubs, Art Galleries, Bookstores, Restaurants, Afternoon Teas, Auctions, Openings, Wedding Ceremonies & Receptions, Festivals, Church Functions, Educational Workshops, CD Projects, Corporate Gatherings, Private Parties and just about any occasion can be genuinely enhanced by our presence. Let us design a custom entertainment package that fits both your needs and your budget! 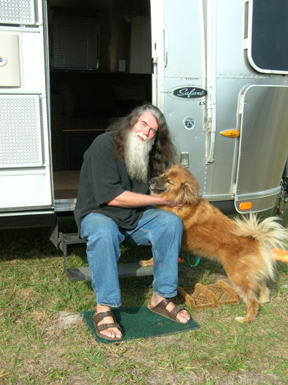 Greg, with former CEO Maggie Muggins, pictured in front of our home, our Airstream Trailer.